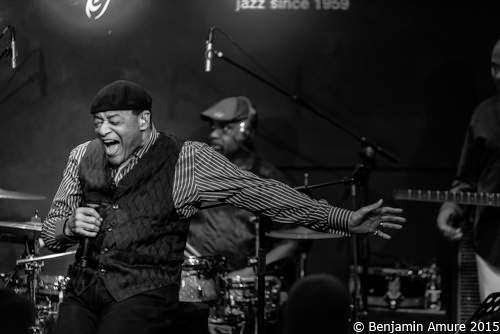 So much love, admiration and sadness is pouring onto social media from fans, singers and instrumentalists alike at the loss of Al Jarreau at aged 76. An incomparable inspiration to all; a vocal chameleon who inhabited songs, embodying bass, percussion, brass, guitar and other instruments with his voice. He was so stunningly connected to the music, literally breathing it and passing it onto his rapturous audience, like a medium channelling another realm. It is hard to believe his ageless energy, enthusiasm and joy has left us. For solace, let's Look to the Rainbow. He was my ultimate hero as a teenage Jazz geek, and I used him shamelessly to proof to my school mates that my chosen musical gene has a fun, pop and sing-along side to it. Al Jarreau was one of my very first non-classical live concert experiences; his "Blue Rondo A La Turk" was the first solo I transcribed as a young alto sax student. Oh, how I loved that man.